Since the mid-60’s, the phrase “Hungarian Mafia” is often and jokingly used in forestry circles in British Columbia. This is not surprising, since close to 100 Hungarian professional foresters found employment in this province during the late 50’s and early 60’s. They worked in a variety of forestry and forest engineering positions, and many of them rapidly elevated into influential positions. The phrase “Mafia” is used because a special bond, a family-like relationship developed between these young Hungarian foresters, as they were trying to shape their careers in unique and sometimes rather difficult situations. What was unique about their situation? Well, to understand this, we will briefly review the history of the Hungarian Forestry School, located in Sopron, the migration of about half of this school to the University of British Columbia, and last but not least, the influence of the graduates on British Columbia’s forestry practices. The history of forestry education in Hungary dates back to 1809, when Forestry was added to the existing Academy of Mining in Selmec, an old mining town (now in Slovakia). The language of instruction was German until 1867, when it became Hungarian. In 1918 the birth of Czechoslovakia was announced, and the Czech troops invaded the northern part of Hungary where Selmec was located. As these events made the future for the School of Mining and Forestry unpredictable in Selmec, professors and students migrated to Budapest, and shortly thereafter, in March 1919, to Sopron, which is still the home of this, close to 200-year-old, Forestry School. Events of the 1956 Revolution in Sopron were different from many other parts of Hungary since no Soviet troops were nearby. As in other cities with universities, the Student Revolutionary Committee took over the local municipal government, and played an important role in running the day to day activities of the city. Also, a large number of students were involved in organizing shipments of medicine, food, blood and other supplies from Sopron to Budapest. These items were brought to Sopron from Austria by Red Cross. On November 4, Janos Kadar formed a new government, and asked Bulganin, the Soviet leader at the time, to use force to stop the revolution. Within hours, Soviet troops began to invade Budapest and several other cities. Attempts to resist the approaching Soviet tanks in Sopron were futile. About 450 students and 50 professors and their families left Sopron fleeing across the open borders to Austria. Of these about 250 were from the forestry school. This was not a planned departure. It happened quickly as the events of November 1956 unfolded. In Austria, Kalman Roller, the dean of the Faculty of Forestry, did everything he could to keep the group together, and to provide them with a suitable situation so that our studies could be continued until we returned to Hungary. Yes, the majority of students and faculty felt that when the Hungarian situation became settled, with western help (we were hoping), we would return to Sopron. When it became clear that the Hungarian Forestry School could not stay in Austria permanently, Dean Roller sent letters to twenty countries explaining the situation. While several countries expressed interest in us, Canada’s response was the most promising one. The Faculty of Forestry at the University of British Columbia offered to “adopt” the Sopron University of Forestry and guaranteed its maintenance for five years until the current students graduated. They had also guaranteed that the education would be continued in Hungarian, gradually phasing in English courses given by UBC professors. Many Soproners felt uneasy about going “so far away”, because they still felt that their emigration from Hungary would only be temporary. After several lengthy debates a large proportion of the students and faculty members decided to accept Canada’s offer. 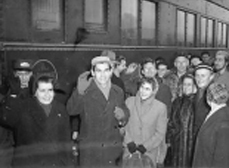 While some returned to Sopron, and others stayed in Europe to continue their studies, 14 faculty members and 200 students left for Canada on January 1, 1957 to establish the new school, the Sopron Division of the Faculty of Forestry at UBC. After short stops in St. John and Abbotsford the group settled in Powell River for “conditioning”, studying English and learning the “Canadian ways of life”. The first academic year began at UBC in September 1957 and was naturally a most difficult period for both students and faculty. Classes scheduled in old army huts in “night shifts” were resented by both students and faculty. Some of us even felt that our invitation was considered as a mistake by the university authorities. In hindsight, there were no reasons for this feeling. On the contrary, there were many signs which pointed to the helpfulness and generosity of our hosts. There was only one barrier between the hosts and guests – the language. In the end small misunderstandings brought about some good results. They created a determination among Soproners and helped to develop a special family-like relationship between them. Credit is due to Dean Kalman Roller, Dean George Allen (Dean of the Faculty of Forestry) and President Norman MacKenzie for their commitment and dedication to make this difficult situation work. By May 1961 the last class had graduated from the Sopron Division to make the total number of graduates 141. It is interesting to note that, as of December 1966, 80.1% of the graduates were resident in Canada, 15.6% in the United States and 4.3% in Europe. 32% obtained a post graduate degree, an unusually high proportion by North American standards. The influence of Hungarian graduates on North American, Canadian and especially BC’s forestry practices is rather difficult to evaluate. For those who work in research or education, and there are many, the number of publications and books written would probably be a good measure to survey and evaluate their contributions. For those who work in practical forestry, for companies, government or consulting firms, the evaluation is much more difficult. However, if we examine the changes that occurred in B.C. forestry practices between the early 60’s up until now, we notice a significant change for the better. No, there is no scientific proof that 100 or so Hungarian foresters played an important role in these changes, but we would like to believe that they did.